I haven’t done much weaving this summer, so I was pleased to find this sweet dolly at antique store. She was a steal at $4. It’s amazing. I finally own a Lightning Weaver. Is this the ultimate small loom? Could it be? Not only is it cute, it’s a cheerful, cherry red. How neat is that? 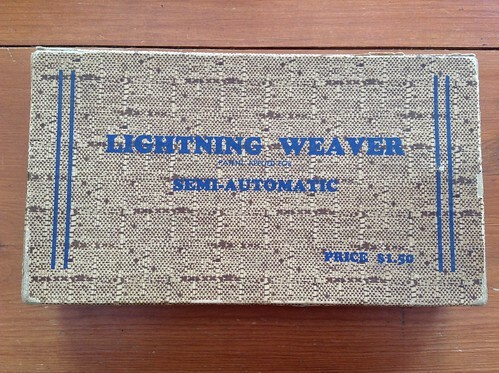 As the box declares, The Lightning Weaver once sold for $1.50. Nowadays, you’ll be lucky to find one on Ebay, and it’ll cost more than a few dollars. 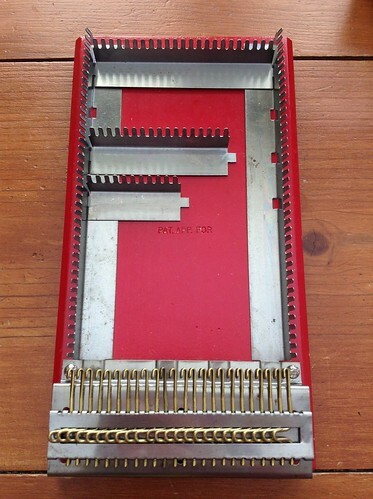 This loom is in perfect condition. It has all the parts, meaning it can be adjusted to 12 different sizes of squares or rectangles, the smallest 2″x3″, and the largest 4″x6″. 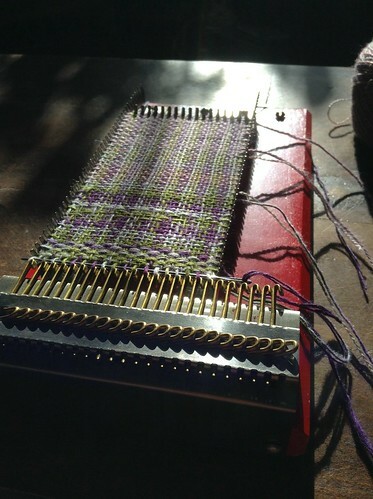 It warps from top to bottom, and then the weft is woven more like a typical loom. 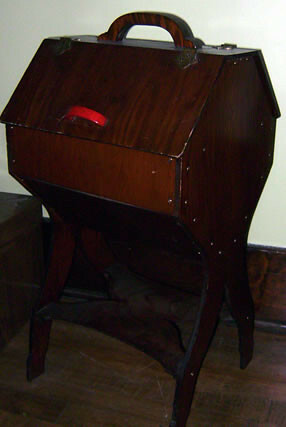 This little loom has rotating hooks on the bottom, however, which allow the weaver to pass the weft through. No “overing” and “undering” like with a Weave-It. Just push the needle through the shed. After you get the weft in place (which does, I’ll admit, take a little practice), you’ll have the fun of changing the shed. This happens by running your thumb over the bottom hooks and clickity-clickity-clickity they all shift the opposite direction, bringing up the lower threads and lowering the top threads. New shed! I’ve found I can use a variety of yarns, too, as I can skip every other hook with thicker yarns, so it’s even more versatile than it seems. And it was already pretty versatile. 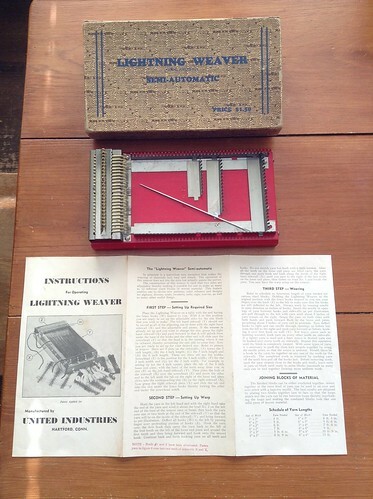 This loom was on my wish list for a few years now, but I’ve only seen one “junior” come up for sale. (FYI: The Jr. Lightning Weaver is not adjustable.) Because it was on my recent searches in Ebay, my husband noticed one come up for sale. 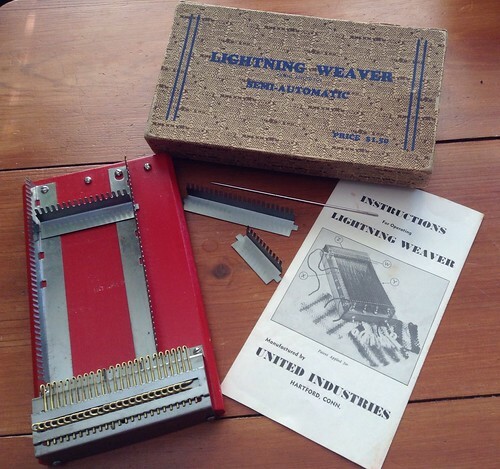 I was sleeping at the time, so imagine my surprise and delight the next morning when he cautiously said, “Did you want a loom called the Lightning Weaver? Because I bought it for you.” Did I! Now, imagine my extreme surprise and delight when it arrived in perfect condition (seriously, was it even used? ), with all the parts, the box, and the directions. Golly! I’ve woven a few bits and pieces to get the feel for it, and then I recently found a great use for it: sampling. I sampled some silk one-ply yarn as the warp and used three different wefts to see what would happen. The top section was alpaca, the middle, a second silk, and the lower the same silk as the warp. I learned that the alpaca kept its form fairly well, although I didn’t care for the color combination. The middle silk gave me the most pleasing look, although I didn’t care for the overall texture, and the bottom silk, although interesting, didn’t stand out to me as something I’d like to wear as a scarf. So, it was a valuable thing to do before spending time warping up a bigger loom with enough to weave a scarf. For now, I’m setting the silk aside until inspiration hits. But will I set aside the Lightning Weaver? Never! 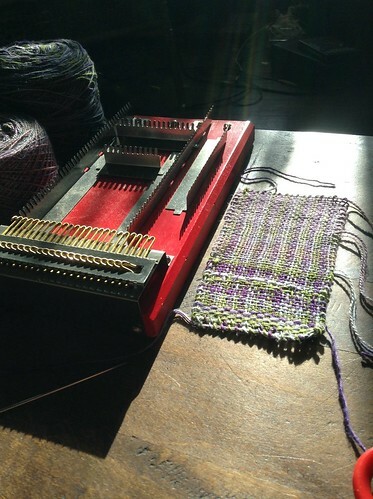 It’s a charming loom that is clearly a tool to be used. This cool (Maslund Duran?) 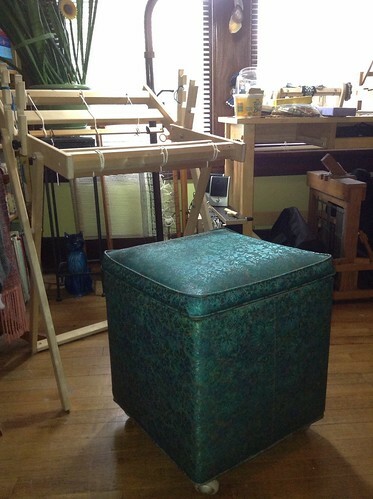 vinyl sewing storage ottoman had my name on it, so I plunked down $15 at the flea market and brought it home. It’s like new, and I can store stuff inside. I swapped out my wooden chair that was too big for this space, and I’m now using this as a chair. 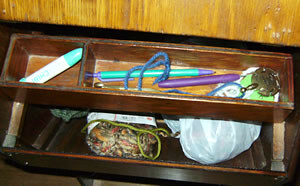 It fits underneath the Glimakra Emilia rigid heddle loom when not needed. Perfect. 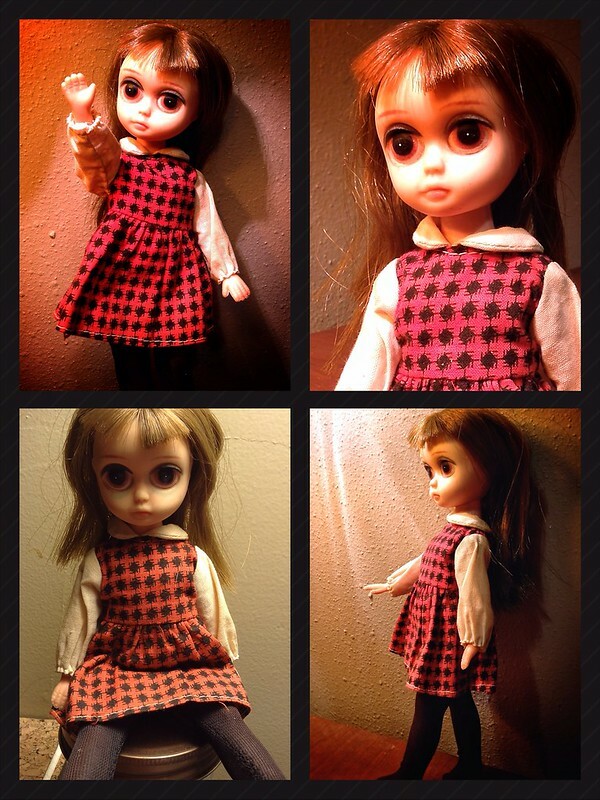 I say “uh oh” because she’s kind of creepy, but even so, I did it–I bought a big-eyed doll, Susie Sad Eyes. Not only are her huge eyes sad and woebegone, she has dark circles under her eyes, poor thing, crooked bangs and a really rough haircut (which I see is the norm for this doll). I first spotted this 8″ doll in a locked glass case at a nearby antique store. With each visit over the past few years, I’d stop by and peer down at the sad creature, and this weekend I couldn’t resist, so I bought her. The price was $24. Now that I know a little more about Susie Sad Eyes, I know the price was really good; however, I’m just not a doll-buying type of person, so for me, it seemed like quite a lot of money. I’m glad I bought her, though. What a strange-looking doll! Susie has a following that’s kind of fascinating. There’s a Flickr group, full of photos of Susies, many who have been updated with new hair, painted eyes, and plenty of modern clothing. There’s even a book dedicated to her, Susie Says, by the same author, Gina Garan, who started the Blythe craze in the year 2000 with her eerie photos of the 1972 doll. Blythe was Barbie doll-sized with a string out of the back of her head that, when pulled, changed eye colors. Talk about creepy! It was manufactured for only one year and then discontinued. If you judge popularity by how many active websites are out there, Blythe has a tremendous following. There are even new Blythe dolls being produced. When you compare little Susie Sad Eyes to Blythe, she’s less popular. Yet another reason to be sad, I guess. Now, I must say that the Ebay prices of Susies are a bit steep. My little doll was a good deal. She even has her original clothes and leggings, but no shoes. The strange thing about Susie is that she’s really photogenic, and I find myself snapping way too many pictures. I assume this isn’t the last time Susie Sad Eyes will show up on this blog! My husband spotted this treasure last spring at an antique store, and when he asked if it was something I would use, I grabbed it. I think it was $20.00. I can fit the large yellow loom inside along with yarn for my current projects. It has a wooden tray that’s perfect for my knitting doo-dads. 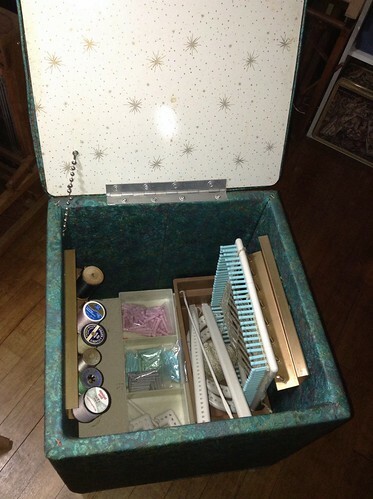 It also has a shelf on the bottom where I set my folder of patterns. I like this because it makes my knitting mobile. I can bring it from room to room easily and I’m not carrying around a lot of plastic bags and extras that I’m not using. I stash everything else in my closet.